You can use the Design view to create a hardware system that you can document and share with other users. The palette on the Design view includes devices on the Live view and NI hardware you can use to create a system. A device on the Design view looks similar to the same device on the Live view. Label—A text field you can edit to name the device. By default, the device label matches the device product family. 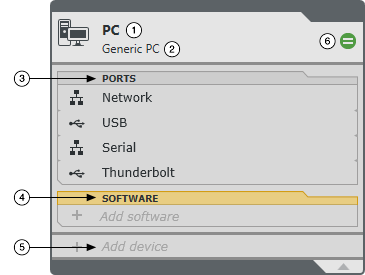 Ports—Connections between devices in your system design. Modules—Modules and empty, available slots in a chassis. Match and link status—Icon that indicates the relationship between the device on the Design view and Live view. A match indicates that the configuration of the device is identical to a device on the Live view. A link indicates that changes to device properties on the Design view apply to the device in your live system. A device can have one of the following match and link statuses. Not Matched The device on the Design view does not have a match on the Live view. Partially Matched The module configuration of the device on the Design view does not match a device on the Live view. Click Update modules in chassis on the Item tab to update the device on the Design view to match the device on the Live view. Matched The device on the Design view has a match on the Live view. Matched and Linked The device on the Design view is connected to a matching device on the Live view. If a device is on the Live view but does not have a match on the Design view, the device appears on the Connected Hardware palette. You can place every unmatched Live view device onto the Design view at once, or you can select specific devices to place. When you place a connected device on the Design view, it has the same configuration as the matching device on the Live view. However, devices on the Design view do not change when modifications occur to a matching device on the Live view. Additionally, SystemDesigner does not remove a device on the Design view even if you remove the matching device from the Live view.